Marialice Patterson, 99, died Friday, March 22, at Shawnee Mission Medical Center, with family by her side. She was born October 22, 1919, in Kansas City, Kansas to Walter Merle and Lela Ellen (O’Leary) Summers. She graduated from Wyandotte High School with the class of 1936 and attended business school in Kansas City, Missouri. She later worked for for Phillips Petroleum Company and State Farm Insurance. She married Dee Alden Patterson in December of 1940 and they first made their home in Kansas City, Kansas, later moving to Merriam, Kansas and then settling in Overland Park, Kansas. They were married for 56 years until Dee’s death in 1996. They welcomed their precious daughter DeeAnne in 1942, while living for a short time in Tampa, Florida, while Dee was in work training there. During World War II, Dee served overseas and Marialice and DeeAnne returned to Kansas City to stay with family there. Living through the war with her husband and her sister overseas in service generated a lifelong spirit of patriotism in Marialice, and she proudly flew the American flag in front of her home daily, where it still flies today. Marialice was a proud employee and a proud mother. She loved to sew clothes for her daughter, and made sure DeeAnne was always stylishly dressed. Her home was always open to friends and family and was the favorite spot for DeeAnne and her friends to “hang out”. After her retirement, Marialice threw herself into volunteering at Shawnee Mission Hospital and was a dedicated volunteer and friendly face at the front desk for over 25 years, only stopping her volunteering when she gave up driving at the age of 95. 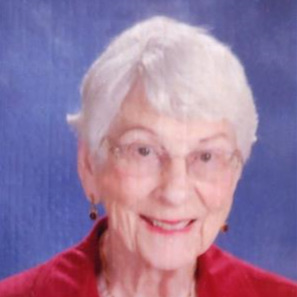 Marialice was a member of the Jane Phillips Sorority and an active member of Rolling Hills Presbyterian Church. In 1996 Marialice moved to Lakeview Retirement Village in Lenexa, where she actively participated in any and every activity offered. She made many friends at Lakeview and thoroughly enjoyed her years there. Marialice enjoyed traveling, and visited all 50 states and several countries. A travel highlight was the Caribbean cruise she took with her 4 generation family at the age of 94. She was an avid reader of books and read the Kansas City Star daily to keep up on current events. She was an excellent seamstress and proud of the clothes she made through the years, including a Barbie doll wardrobe for her granddaughter, Marianne’s doll. She was always eager to participate in outings and activities with her friends, including casino trips, mystery bus trips and dinner theater and supper club outings until just 2 weeks before her death. She was preceded in death by her parents, her husband, an infant son, James Merle, and her very close ‘Lil’ Sis’, Virginia Summers. She is survived by her daughter, DeeAnne Harnden and husband, Jerry; granddaughter Marianne Smith and husband, Steven; grandson, Jonathan Harnden and wife, Kendra; great-grandson, Dillon Boeh and wife, Celsie; and great-grandson, Drew Boeh. Visitation will be 10:00 AM to 11:00 AM Monday, March 25 at Porter Funeral Home, 8535 Monrovia St, Lenexa; followed by a funeral service at 11:00 AM. Private interment at Highland Cemetery in Ottawa, KS. Memorial contributions may be made to Rolling Hills Presbyterian Church or Shawnee Mission Medical Center in care of the funeral home. My sympathies in the death of Marialice .She and my aunt MargueriteThomas had been friends since kindergarten in KC,KS.,keeping in touch all these years. They both moved as widows to Lakeview Vlge, and ate supper together every night. As Marguerite lay dying, she was determined to call Marialice to tell her she would not be at supper, and kept repeating her phone number! Little did she know that Marialice had also been sent to , and died the day prior to Marguerite! Friends to the END. God bless them both. Marsha Chezek.